Quick – someone asks you whether you will bet on Hillary Clinton winning the next election. Would you take that bet? At even odds, you would have to be insane. But what if someone offered you 100-to-1 odds? How about 1000-to-1? At a certain point, it’s worth a punt. And this is the trouble with discussing option trading. At times, even if you don’t think a specific outcome the most probable result, it still makes sense to take a position based on the market underpricing the probability of that outcome. It’s a nuanced difference, but often missed by the financial media. I am not a big Eurodollar futures trader, but I recognize that it is one of the biggest, most liquid markets in the world. And if you are a STIR (short term interest rates) trader, then you are most likely aware of the interesting option order flow that has been crossing the tape all summer long. The pits are abuzz with talk, but for the rest of us who aren’t clued into the intricacies of the fixed-income option market, we are probably overlooking this huge bet that is being slapped on. For me, I rely on Alex Manzara’s blog, Chartpoint, to keep me up to date on the developments in the Eurodollar pit. Alex is an institutional futures broker at RJ O’Brien and all-around nice guy in that Chicago sort of way. Alex has recently been highlighting the activity of in the Eurodollar futures option pit where a client (or maybe a group of clients) has been aggressively selling long-dated put ratio option spreads. Got that? Yeah, it’s a mouthful and sometimes deciphering the language of options traders leaves you scratching your head wondering if they are speaking the same language. But let me walk you through what’s happening and then we can ponder the implications. This morning, Alex sent me an update on the action in the Eurodollar options futures pit. Let’s try to decipher it. The underlying contract month is represented by EDM0. 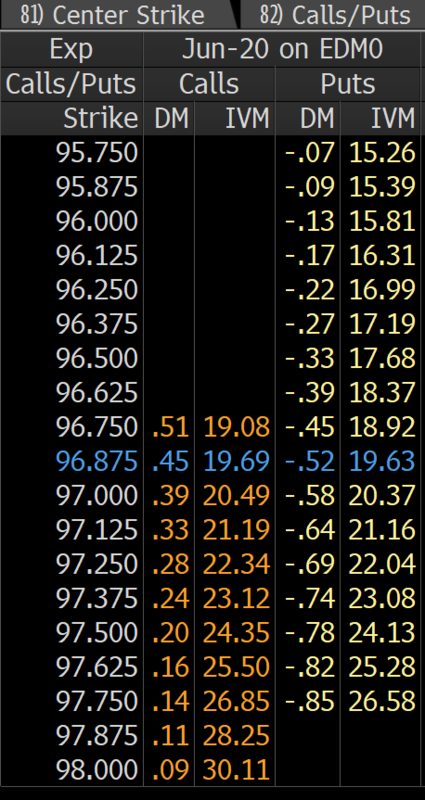 This is the June 2020 Eurodollar futures contract. M is for June and 0 is the last digit of the year. Then the “9650-9600 ps” signifies a put spread with the strikes of 9650 and 9600. “1×6” refers to the fact that it is a ratio put spread. The next part “ppr sells 6 legs over at 7.0 ref 9694. 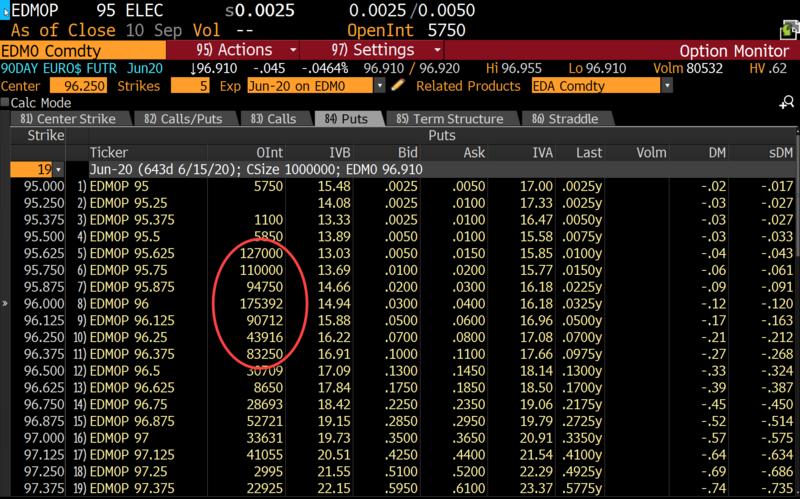 1k only” means the “paper” (which equates to “client” in the language of the pit) sells 6,000 9600 strike puts and buys 1,000 9650 strike puts for a net credit of 7.0 ticks. The fact that the put ratio was done for a credit of 7 ticks means that the actual prices for the spread would be something like 0.0325 for the 9600 puts and 0.125 for the 9650 puts (0.0325 * 6 – 0.125 = 0.07). The actual specific prices don’t matter as long as the net amount equals 7 ticks. Finally the “ref 9694” means that the actual future was trading at around 9694 at the time of the trade (as opposed to 9692.5 in our example above). Great. So now we understand ED option trader-lingo, so what? How’s that going to help our trading? Although today’s order was only 1,000 contracts by 6,000, over the past couple of months this trade has been done in size. Over and over, and then some more. This whale-of-a-trader has been buying closer-to-the-money-puts and funding it by shorting gobs of out-of-the-money-puts. This position has been put on in unprecedented amounts. This is obvious when we look at the open interest figures. Sticking with the EDM0 contract, we can see a marked increase in open interest as we head down the strike curve (I am using EDM0, but the trader has been doing this trade on many far-dated months). In practical terms, if there is a large trader demanding liquidity in options that are close to the money, while shorting many multitudes of options in puts that are way out of the money, then this will influence the shape of the vol curve. Although many market observers are accustomed to lower strike puts being more expensive in implied volatility terms due the well-known skew in the equity option market, there is no law dictating that all markets need to trade with such a skew. Have a gander at the table below, focusing on the IVM column (implied volatility at mid price). Look closely at what happens to the implied vols as the strikes become smaller. Instead of the vols increasing, the opposite is happening. Now to some extent, I get it. A jump condition (every short gamma trader’s nightmare), would most likely be to the upside in Eurodollar futures. Imagine some horrific geopolitical disaster that causes equities to crack by 20% overnight. In that scenario, short-term rates would most likely be slashed and Eurodollar futures would rally hard (all else being equal). So having the opposite skew than equities makes sense. But to think that this skew hasn’t been influenced by this monster-of-a-trader who keeps wailing on the out-of-the-money puts would be naive. When dealers got hit with the first 25,000 out-of-the-monies, I am sure they were immediately bid. But when this selling continues day after day, the natural consequence is for them to lower their bids. When the big client started putting on this trade a couple of months ago, the futures were higher along with implied vols. As both the underlying and volatility has drifted lower, the trade has been a good winner for the client. What is the client really betting on? If we stop to analyze what market view this client’s position is trying to express, we can probably agree that, above all else, a large move higher in rates is the one thing that will hurt the most. Depending on the strikes, some rate rise would be profitable, but an-above-consensus-move would be disastrous. It’s easy to understand why the client would be willing to take this bet. The Federal Reserve has been the most aggressive major Central Bank out there. Over the past two years, they have raised the Fed Funds rate by 150 basis points. When combined with their bold policy of quantitative tightening, there has been a tremendous amount of stimulus withdrawn from the US economy. This bet is in essence a way to express the view that the Fed is tightening into the next recession, and that this tipping point is sooner rather than later. Is this the most probable outcome? Most likely, yes. But is the market accurately pricing the possibility of an outsized rate hike scenario? Nope. Not a chance. Already leaning that way, but this is a cheap way to play it. I have long thought market participants have underestimated the possibility for dramatically higher rates. 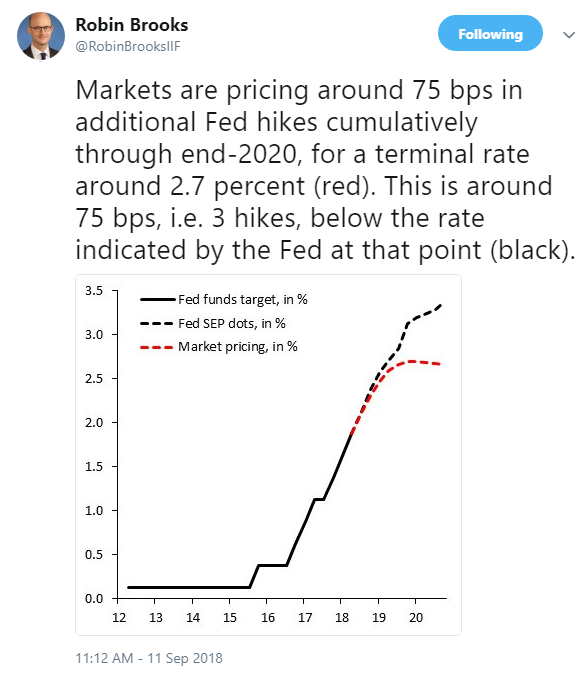 Although I still think such a move will be led by the long-end, in general, I am willing to bet on all rates going higher than most can imagine. 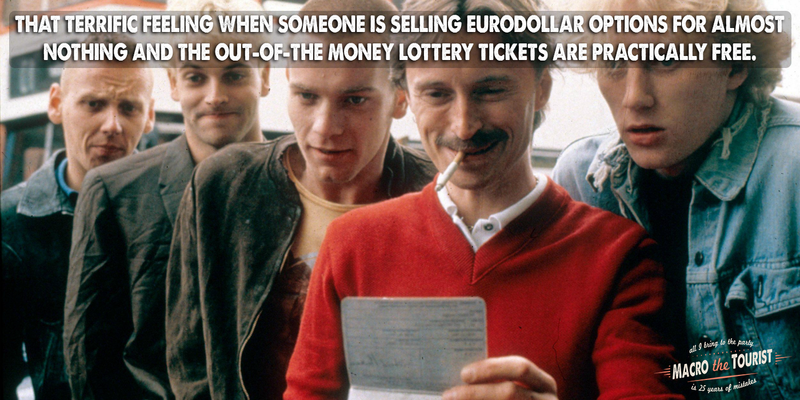 This monster-trader’s relentless supply of out-of-the-money Eurodollar puts means we can pick up lottery tickets at a discount. Everyone thinks the Fed is almost done raising rates. Consensus is firmly in the camp that the Fed will stop hiking in about 3 hikes. What if the market is once again overly optimistic about the Fed’s policy trajectory? What if the Republican tax cuts have finally ignited the “animal spirits” and this economic expansion accelerates from here instead of rolling over? Yeah, it is not the high probability bet. Will those out-of-the-money ED puts most likely be dust? Sure. But that doesn’t mean they aren’t buys down here.